Great Lakes Shipwreck Maps - historically accurate shipwreck posters, of Lake Superior, Lake Michigan, Lake Huron, Lake Erie and Lake Ontario 24 x 30 inches, shipped rolled in a tube. 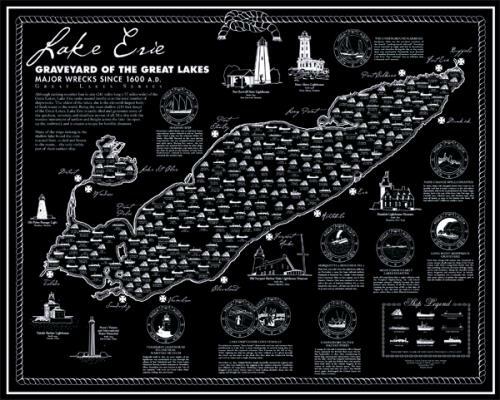 Attractive, fascinating and historically accurate shipwreck posters, available for all five Great Lakes. A double-ink printing technique is used to create the dark navy blue on cream paper. The result is a stunning, rich effect. For anyone interested in shipwrecks, these maps offer the very best information regarding when, where and what. “Portholes of History” give you insight, facts and figures. 24 x 30 inches, shipped rolled in a tube.
. 24 x 30 inches, shipped rolled in a tube.